SURFACE systems+technology GmbH & Co. KG offers a wide range of Pulsed Laser Deposition (PLD) and Ultra-High Vacuum (UHV) systems and components. The PLD Workstation is our compact and versatile all-in-one PLD system. This tool is perfectly suited if just a PLD system is required, without the need for vacuum sample transfer or additional deposition and analysis methods. Our Laser MBE system is a modular solution that grows with your needs. 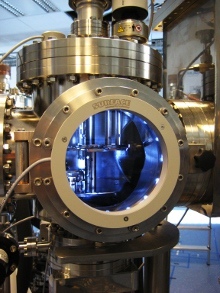 It provides in-vacuum sample and target transfer from a load-lock into the Laser MBE module (Laser MBE essentially is PLD in an UHV-compatible environment). It can be upgraded into our Laser Star cluster system with a central transfer and storage module. Additional vacuum chambers can be attached to this system to allow for different thin film deposition and analysis methods while keeping the samples under UHV conditions. SURFACE also designs and builds PLD systems for large substrates. Pulsed laser deposition onto large-area substrates requires systems adapted to the substrates and materials involved, so SURFACE designs these systems according to the requirements of the customer's application. We also offer a range of components especially suited for PLD applications, e.g. target holders/manipulators, substrate heaters/manipulators (oxygen resistant up to 1000°C), laser heaters (enabling rapid temperature changes, or selective heating of films), and high pressure RHEED systems that can operate at the pressures present in a PLD chamber. R-DEC Co., Ltd. RHEED electron guns and the R-DEC PICO RHEED system are excellent choices for RHEED in MBE applications, and for RHEED analysis of sensitive (organic) films. SURFACE distributes R-DEC products in Europe. SURFACE also has a range of UHV products and accessories: Special LED flange lights attach to any standard CF viewport. They provide ample lighting into the vacuum chamber by a ring of bright white LEDs, and the center of the viewport stays available! The SURFACE vacuum transport case connects any vacuum system to the analysis facilities of the world: This compact unit attaches to your deposition chamber, a sample is transferred into the transport case by the built-in transfer system, and kept under UHV conditions while the transfer case is brought to the analysis facility or beam line. A state-of-the-art getter pump maintains UHV conditions for several days without power supply, ideal for transport by car, train, or airplane! SURFACE can also design and build UHV process chambers/systems for your thin-film deposition needs, e.g. for sputtering, evaporation with multiple sources, etc.